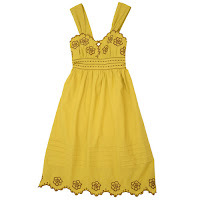 I hope you ladies are having fun with our "Name This Dress" Contest. We're having a blast going through the list of names! Everyone is so creative!! I must say some of them are pretty funny too (ex. "Pop My Cherry Blossom" hehe LOL). We've had 50 entries and there is 5 more days to go. I might have to start shortening the contests. Don't worry, this is only the first of many Ruche's "Name This" Contests. On another note, do you know what the difference is between organic cotton and non-organic cotton? A whole bunch! But to simplify things, cotton is the most pesticide-dependent crop in the world, accounting for 25% of all pesticide use. Organic cotton is produced without the use of harsh chemical bleaches or dyes, and is allergy free. We got a new item in today! The "Going Seagreen Organic Top" made with 100% organic cotton. The shirt is super soft and comfy. Going Green is a huge thing right now. This is the kind of bandwagon that Ruche would proudly join and support. Get them soon while they're still in stock! Oh my goodness...Okay, I'm a lil starstruck right now because I think Richard Chai actually read my last blog post!!!! Why do I think so? Please read the comments on my last post! Richard Chai, if you ever read this...You just made my day (actually week)!!! You know what else made my day? TJMaxx sent me a $200 gift card for joining and being active in their What's In Community. I guess they went searching for bloggers and I was fortunate to be included. I haven't gone to TJMaxx in a while, so I was pretty amazed at what they had. They had a pretty decent collection of denim jeans - 7 for all mankind, Joie, R&R, Chip & Pepper, Joes, and some others. I decided to stay away from designer names today and did some budget shopping instead. I love solid colors because they are so easy to mix and match. You would be amazed what a difference accessories can do to a plan solid color outfit. Maybe when I get a chance, I'll take some pictures of what sort of outfits I can make with my new purchases + some accessories. You know where I will be on August 3rd??? TARGET! Richard Chai is Target's next GO International designer and his collection will be launching August 3rd. I just love his mixture of color and texture in his clothing. Last month, I was able to grab a couple pieces from Rogan Gregory's eco-friendly collection, each piece less than $20! I picked out a couple pieces that I thought were "modern vintage". You can view the rest of the collection here: Richard Chai for Target. I love the green and blue color block outfit. The thick brown belt adds the finish touch with a hint of vintage. Here comes another color block outfit. Vivid purple dress with a tie in front toned down with a long gray cardigan. Purple and gray goes so perfect together don't you think? I like this deep purple color and the graffiti rose print is sorta like the new "modern tapestry". Notice anything in common on all the looks? The shoes! I'm not sure if they have those shoes available at Target. But I was ecstatic to find out that they sorta look like one of the shoes at Ruche! When I got them for the shop, I knew they were versatile...but actually seeing them on all these different outfits just proved my point. They look perfect with skirts, shorts, capris, tights, jeans. The ones we carry at Ruche are canvas and has 1 1/4 inch heels, which I think is the perfect height by the way. They aren't too high, but enough to lengthen your legs a bit. Today I feel like writing a more personal post. Those of you who have been following me for a while (since Fusion Boutique) may have known that I got married a lil more than 2 years ago. Our two year anniversary was in June =). It has finally occurred to me that it was about time I changed my last name. I've been putting it off for a while, not because I didn't want to change my name (okay..maybe that is one of the reasons hehe jk), but honestly, it just seemed like such a big hassle. Waiting in line at the Social security, dmv, bank, insurance UGGHhhh.....Here is link in case anyone is curious: http://weddings.about.com/od/getorganized/a/changeyournam.htm. Anyhow, this morning I finally decided to get it done. After 2 hours of waiting in line, I finished off the first step (Social Security). I came in expecting to be able to move my last name to be my new middle name; I left with just a first name and my husband's last name. I was SOOOOOOO bummed that they didn't let me move my last name to be my middle name =(. Apparently, you have to get it done through court and it is a whole long process. So today...I must say, was a strange day. After only 27 years, I had to depart with my last name. I'm sure those of you who went through this felt the same way at first. I don't know exactly how to explain the feeling, it is just...strange. I'm sure I'll eventually get over it, right? On a happier note, its FRIDAY!! Whoo HOOo! Sorry I've been neglecting you all. I've been super busy. I know a lot of you have been asking for measurements on various items. I'm going to get everything up on the site after this weekend. That includes measurements for clothing, bags, and jewelry. Also, I'm working on my Press page on the boutique. 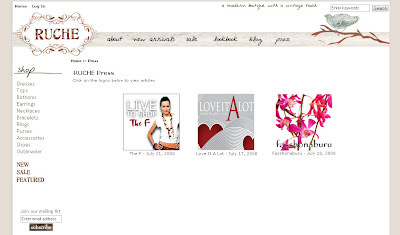 If there are any bloggers out there that would like to do a feature on shopruche.com or any items on it, please let me know! I'd be more than ecstatic! It is tough getting exposure on an online boutique, especially when there are tons of them out there. I just hope that shopruche.com is unique enough to stand out in the crowd. Anyhow, if you're interested, I'd like to post a lil logo of your blog and a description on my press page with a link to the featured blog. Ahhhh...a sigh of RELIEF! 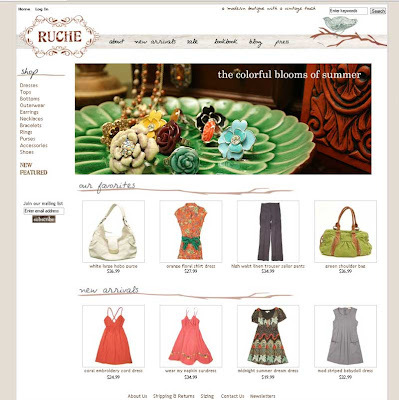 I am very happy to announce that ShopRuche.com has finally launched!! After months and months of hard work, I can finally take a little breather. I know there are still many things that I'd like to update on the site, but I think it is in a good enough state to launch. I'll be working on getting measurements out for the clothes. In the meantime, if you need any specific measurements, please don't hesitate to contact us! If you see anything wrong or have any comments or suggestions, please leave me a comment =). I am Mai, the owner of shopruche.com. I have lived in sunny Southern California all of my life. I am happily married with a four legged son (my doggie). Inspired by many fashion bloggers and my interest in fashion retailing, I have decided to open up a "modern vintage" online boutique. I call it modern vintage because it composes of new items but inspired by a vintage look. I wanted an online boutique because I wanted my items available all over the world. In the future, I am planning to include real vintage finds that I've found in local flea markets and thrift shops. 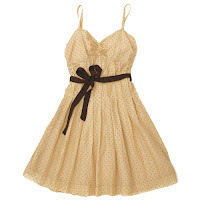 But in the mean time, I hope you enjoy my blog as well as the fashion selections I have provided you on shopruche.com. I am planning to keep this blog to update you with my latest web finds, store updates, and just random thoughts. Thanks for dropping by!